We studied the presence of benign infantile epilepsy (BIE), paroxysmal kinesigenic dyskinesia (PKD), and PKD with infantile convulsions (PKD/IC) in patients with a 16p11.2 deletion including PRRT2 or with a PRRT2 loss-of-function sequence variant. Index patients were recruited from seven Dutch university hospitals. The presence of BIE, PKD and PKD/IC was retrospectively evaluated using questionnaires and medical records. We included 33 patients with a 16p11.2 deletion: three (9%) had BIE, none had PKD or PKD/IC. 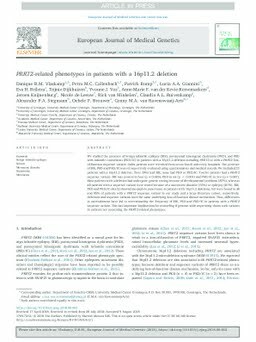 Twelve patients had a PRRT2 sequence variant: BIE was present in four (p = 0.069), PKD in six (p < 0.001) and PKD/IC in two (p = 0.067). Most patients with a deletion had undergone genetic testing because of developmental problems (87%), whereas all patients with a sequence variant were tested because of a movement disorder (55%) or epilepsy (45%). BIE, PKD and PKD/IC clearly showed incomplete penetrance in patients with 16p11.2 deletions, but were found in all and 95% of patients with a PRRT2 sequence variant in our study and a large literature cohort, respectively. Deletions and sequence variants have the same underlying loss-of-function disease mechanism. Thus, differences in ascertainment have led to overestimating the frequency of BIE, PKD and PKD/IC in patients with a PRRT2 sequence variant. This has important implications for counseling if genome-wide sequencing shows such variants in patients not presenting the PRRT2-related phenotypes.